This maths game combines crafting, turn taking and a bit of science as well as the chance to work on counting and number ordering. It’s easy to create the materials for the game and you can adapt it to suit whichever set of numbers you’re working on – or make a set with letters if you want to practise the alphabet. You’ll need to start by making a set of fish. 1. 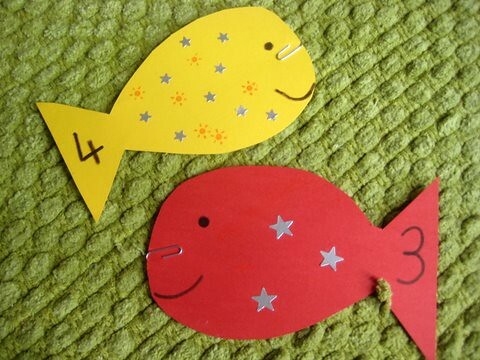 Cut out some fish shapes from some coloured card and let the children decorate them. Leave a space on each one to add a number. 2. Fill in the numbers on each fish. We start out with numbers 1-10 but you can add more, or perhaps use 10, 20, 30… depending on which number sequence you’d like to play with. 3. To make a magnetic version you can add a metal paperclip near the mouth of each fish. You can then use a magnetic fishing rod (which you can make by trying a magnet to a piece of string) to go fishing for your number letters. Place the fish, number side up, on the floor, in a hoop or in a bucket. Or make an undersea landscape picture for them to swin in. The easiest version of the game is to practise your hand-eye co-ordination and just let the children go fish. See if they can recognise the numbers on each fish they catch. Encourage the children to co-operate and take turns with the fishing rod. You can aim to catch the fish in ascending or descending number order, or just see which ones they catch and arrange them into a sequence once they’ve all been caught. Tell the children you had ten fish when you started and, as they catch the fish, ask them if they can work out how many more must be left in the pond. You can try some sums too. Pick a number, say 3, and then catch a fish. Can you add the number on the fish to your starting number of 3? (you might like to use a number line to help work this out). Or have the children catch two fish and see if they can add their numbers together. If you have an older sibling playing along they can practise their number bonds. If they catch a 3, what number do they need to add to get to ten? They could work on times tables too. As an alternative, you can make version of the fish with letters instead of numbers. When they catch a fish you can see if the children can say the sound of the letter they have. Can they think of something that starts with that letter? Can they find something in the room that starts with the letter? We like to use this game to make numbers (and letters) fun and have the children approach learning them in a playful way. How do you add numbers to your play? These are wonderful. I have a printable set of math fish with numbers and quantities on my blog. Not as crafty, but quite fun to play with anyway! We’ve done something similar. The kids loved it! What a fun idea! Love that your making it a math game too! Oh, now I want to go to Ikea!